Wednesday, January 31, 2001…The American Red Cross of Central New Jersey has announced that the Infinity Foundation has established a matching grant program of $10,000 with all proceeds to go to the American Red Cross Indian Earthquake Relief Fund. Individuals and companies that donate to the American Red Cross of Central New Jersey Indian Earthquake Relief Fund, the Infinity Foundation will match donations of $500 and up to a total of $10,000. Credit card contributions can be made by calling 609-951-2126 or 609-951-8550. For more information please visit http://www.njredcross.org. Earthquake occurred on January 26, 2001. 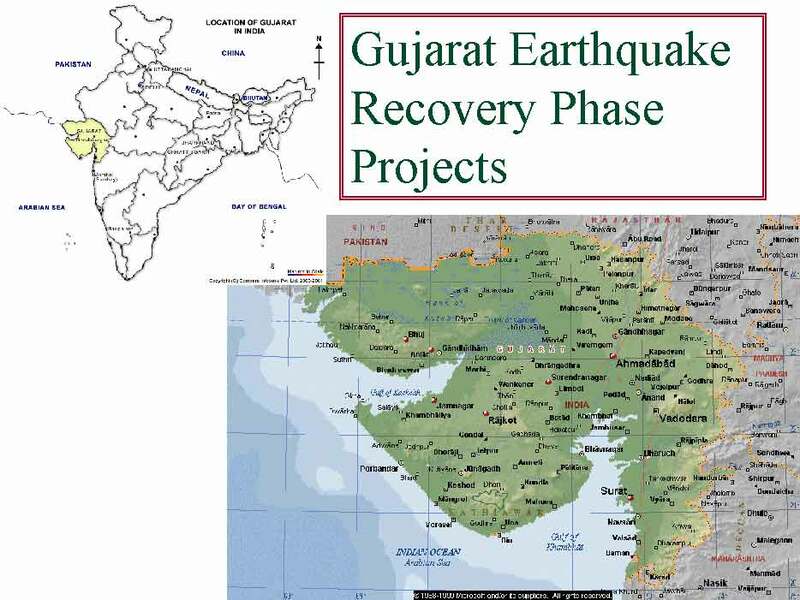 The Indian Red Cross Society has asked for ARC assistance in developing a psychosocial support project for the benefit of those affected by the Gujarat earthquake, as well in developing the capacity of the IRCS to provide similar services in future disasters. Proposed project, beginning May/June 2001, will target affected areas of Kachchh district, population approx 400,000. Duration: initial project: 6 months, followed by capacity building of IRCS over 2 -3 years. Objective: Improve longer term water availability through community-based watershed management and water harvesting initiatives involving the repair and enhancement of community facilities for collecting surface water runoff; a significant source of water in Gujarat. ARC inputs to include technical assistance to the Indian Red Cross Society in disaster preparedness and response. Activities may include delivery of training modules on disaster management and relief distributions and advance placement of relief supplies. This grant was for The American Red Cross, New Jersey Capital Area Chapter. The grant was used to expand the health and safety programs to youth in Mercer County. These programs will help people prepare for and prevent emergencies, which epitomizes the philosophy of the Infinity Foundation. The Red Cross will provide an intense skill building community program to youth in Mercer County. The need for this program was recognized through meeting with other community based organizations who portray a high percentage of their clients as socio-economically deprived. Many lack the basic social and communication skills necessary to cope with their environment. These youth are in desperate need of education and training that will establish a foundation to promote and reinforce healthier lifestyles. through adulthood. One of the most significant roadblocks to expanding these programs is the inability of participating organizations to pay for the materials and the equipment necessary to conduct the training course. The American Red Cross will deliver these courses using trained volunteers. The Red Cross will train high school students to teach in lower grades, will train adult instructors for after school programs and will also teach individuals within the organizations to deliver these programs to their constituency. All instructors will receive the same high quality uniform training given to all Red Cross volunteers. The Red Cross will work with schools in Mercer County as well as community based youth agencies to reach a high number of youth with these programs. The lack of skill building services for youth is reflected in the number of youth who make inappropriate choices that lead to unhealthy lifestyles. Ultimately, the skills gained in these programs will provide the tools to make informed decisions and select wise choices that positively impact their personal growth and development.